This range has been designed to blend into, or create, rural environments such as country parks, riverside walks and forest paths. These rustic products are available in sawn green European oak, treated softwood and iroko. European oak is a hard, heavy and durable material, which will outlast the similarly styled lightweight softwood products also on the market. Treated softwood used for this range, is sent for CCA treatment after we have cut and machined the components, so that all the final surfaces and end grain are properly protected. When specified in European oak the seat and picnic unit have a relatively high moisture content, so some degree of surface checking, splitting, shaking and warping will always occur, particularly if long hot periods of weather occur soon after installation. This movement is normally confined to the first year, and does not look out of place in the informal locations for which these items are intended. 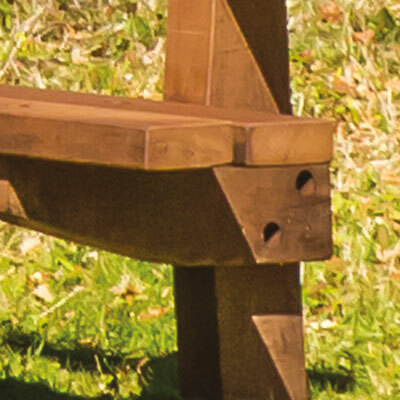 The condition of seats and picnic units, in particular, should be reviewed after approximately six to eight weeks, and their top surfaces briefly sanded down with coarse sandpaper, and any sharp protrusions removed with a trimming knife. If the units are re-stained at this stage it will considerably improve their appearance. We supply 500ml of stain free with every seat or bench delivered (1000ml with a picnic unit), to enable this work to be done. Items made from iroko are much more stable, but more expensive. The litter bins use partially air or kiln dried oak slats in their construction, so these items are less prone to movement. 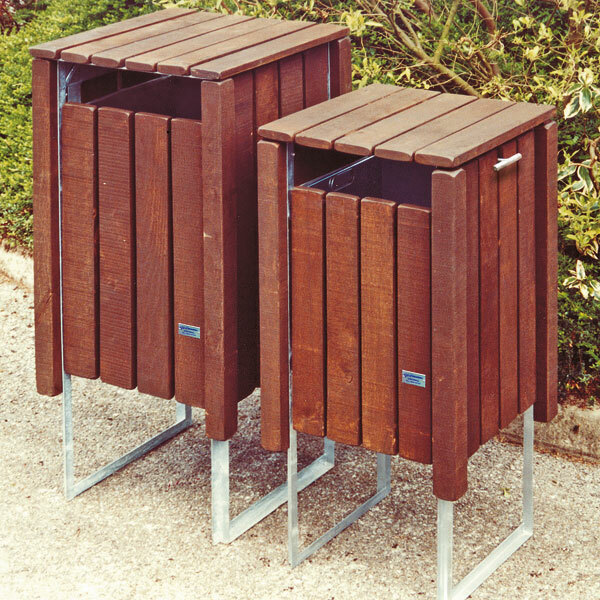 The liner access arrangement for lidded bins is illustrated in Woodland Bins. We also manufacture smaller versions of the Woodland seat, bench and picnic unit in our Junior Range. Woodland Range seats can be specified for commemorative purposes for which several types of plaque are available in inscription service. Because of the corrosive effect of the tannic acid in the oak, only cast bronze and engraved stainless steel plaques are suitable for oak boarded products. 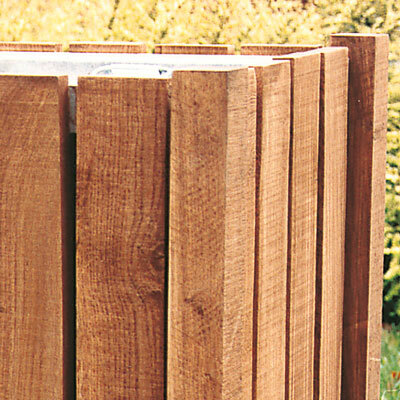 This rustic product has a substantial but unobtrusive galvanised steel frame which extends 300mm into the ground, onto which the slats are fixed.